The pre-wedding celebration was attended yesterday by Mahesh Babu's wife Namrata Shirodkar, Ram Charan and his wife Upasana. The big fat wedding celebrations begin! Designer Shriya Bhupal is marrying entrepreneur Anindith Reddy in a few days and the pre-wedding celebrations for the families have begun. The grand wedding events began from July 4th and a Telangana wedding will take place in Hyderabad on July 6. As the bride-to-be is a fashion designer and owns a fashion label called ‘Shriya Som, her enviable ensembles for the wedding events is something that everyone is looking forward. Yes, for the ‘Brunch’ event, Shriya made a stunning appearance wearing ruffled tailor-made dream in a red gown by Ashi studio. Shriya Bhupal wore the gorgeous gown with a touch of traditional accessories. She wore an armband and earrings to complete the indo-western look. On the other hand, Anindith looked handsome in a floral kurta. 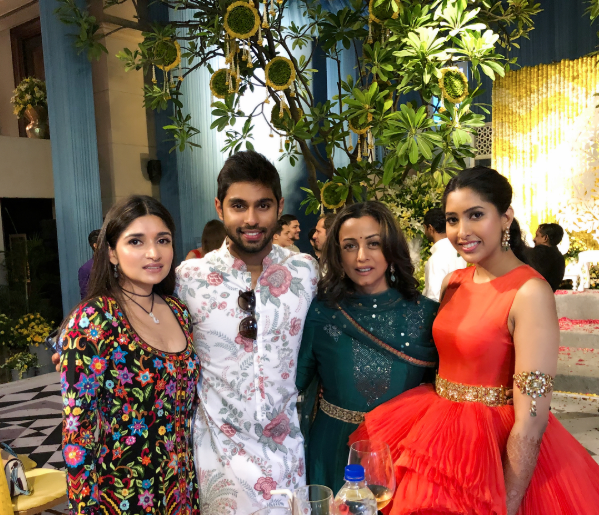 The pre-wedding celebration was attended by Mahesh Babu’s wife Namrata Shirodkar, Ram Charan and his wife Upasana, who is the cousin of the groom. Namrata shared glimpses of #thebigfatindianwedding and they all looked absolutely stunning in glammed look. 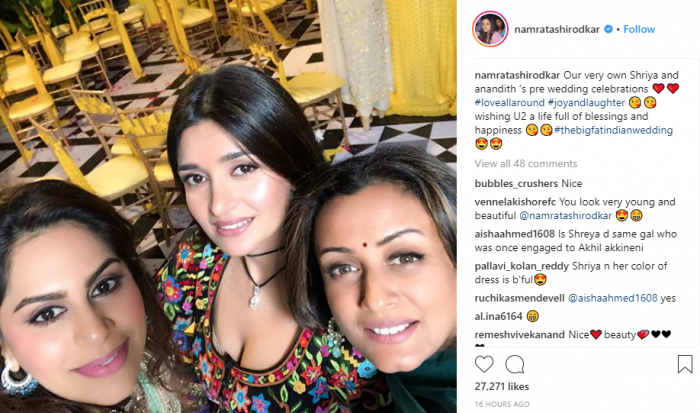 Ram Charan’s wife Upasana Kamineni also took to Instagram and shared more pictures with her besties Namrata Shirodkar and Dia Bhupal. Shirya is the granddaughter of Hyderabad tycoon Dr. GVK Reddy (her mom, Shalini is his daughter). Anindith is the eldest son of Vishweshwar Reddy, sitting MP of Chevella and one of the richest politicians in Telangana. His mother Sangita is the sister of Ram Charan’s wife Upasana’s mother. Anindith made a prominent mark for himself in the domestic Motorsport circle.